It’s amazing what a bit of political stardust can do. First, President Obama and his wife Michelle shone the global spotlight onto Moneygall. Then, when the G8 summit descended upon Lough Erne Resort, Obama lit up the Fermanagh Lakelands. Lord knows, but the troubled five-star resort needed the opportunity. Built at a reported cost of £30 million at the giddy height of the boom, Lough Erne recently returned to the market for a third of that. That wasn’t all: this January, a fire broke out in the pool and leisure area. Did Obama sprinkle his magic? And what is there to do in the Fermanagh Lakelands, anyway? I took my wife and young kids to Enniskillen to find out. Shortly after Enniskillen (the journey from Dublin takes about two hours), we drove into an estate sitting snug against the lakeshore and braided with a Nick Faldo-designed golf course. The inspiration, apparently, came from Loch Lomond in Scotland. Not a bad start. The hotel itself is a sandstone, country-manor style building, surrounded by several lodges with conical towers pointing skywards. It dates from the mid-noughties, and still has the feel of a new arrival about it – despite the old-world luxuriousness oozing out of the oak panelling, thick carpets and tinkling piano. The building is beautifully framed by the lake. Check-in was textbook. A receptionist named William sorted me out with keys, maps and gift bags for the kids. When I asked about food, he printed off menus. When I asked how to get to the hotel from our lodge, he showed me a path where the kids were more likely to see swans and other wildlife. Expectations were duly exceeded, as they should be. As well as the luxury rooms and suites in the hotel itself, Lough Erne Resort has invested in 25 lodges overlooking the lake. We checked into No.22, a two-bed, self-catering option featuring a Rapunzel-style tower topped with a cone of natural slate. The fit out was superb – right up there with the best hotel lodges I’ve experienced in Ireland. There was tasty underfloor heating, Sky Sports, walk-in wardrobes and furniture that feel fresh-from-the-packet. Lake views felt romantic… even in the pouring rain. On the downside, the distance between the two bedrooms was considerable, which meant propping doors open with chairs so we could hear the kids downstairs. The Bitbuzz Wi-Fi set-up was annoying too, requiring several passwords and a fresh sign-up with every device. Lough Erne has put thought into its food, and it shows. Prices don’t take the proverbial, either: in the Blaney Bar, both the mini ‘glamburgers’ and fish n’ chips cost £10/€12. Likewise, three courses at Catalina, the hotel’s fine dining restaurant, cost £39/€46. The chef overseeing everything is Noel McMeel, and he catches our eye with some deliciously composed starters and desserts in particular. The arrangement of a light Dingle Bay crab salad is almost painterly on the plate, and a baked mullet and braised endive dish evokes an orange sunset on black slate. The glazed lemon tart looks as good as it tastes. The dining room itself is a lovely, classy space, with clean rather than a cluttered air, but our dinner service was far too fast. We arrived late (at 8.50 for an 8.30pm booking), but even so, were supping coffees by 10pm. It all felt a bit rushed. Breakfast brought the best service of all. We were brought to our table by hosts carrying chilled jugs of fresh OJ, before tucking into a buffet stocked high with juicy fruits, pert meats and cheeses and fresh pastries – all overlooking the lake. The hot sausages, bacon and pudding were decent, but for the best eggs, out tip is to order fresh from the kitchen. Golf is of course the main event at Lough Erne, with the Nick Faldo-designed course complementing a further 18 holes at Castle Hume. Rory McIlroy was the resort’s touring professional for a time, so you’re following in some pretty impressive footsteps. Lough Erne’s spa and pool have been restored after that unfortunate fire, and we spend our Sunday morning enjoying the facilities. The 14m pool and changing rooms are small but slick, and back and head massage treatments went down a treat at the Thai Spa. Elsewhere, although Lough Erne welcomes kids (there are junior menus and goodie bags, as well as little slippers and gowns), I’m surprised to find it doesn’t have a playroom or playground. Adults, however, can relax with afternoon tea in the Garden Room, a drink in the Blaney Bar, or by retiring into the Gordon Wilson library. It’s water, water everywhere in Fermanagh – but the Lakelands offer plenty to explore on dry land too – not to mention underneath it, in the spooky Marble Arch Caves. We enjoyed a Saturday saunter around Enniskillen town, the highlights of which were a great ham and turkey sandwich at The Jolly Sandwich (3 Darling Street), and the sight of our three-year-old getting his hair cut at a barbershop doubling as a railway museum. Set down a lane off Darling Street, Headhunters (headhuntersmuseum.com) is one of a kind, combining an old-school barbershop with vintage tickets, signal lamps, cast-iron signs and even track-inspection cycles from the golden age of Northern Ireland’s railways. We also take a trip to Forest Stables (Fivemiletown, prices from £10) where Mum and Rosa (7) mount Google and Bluebell for a riding lesson. It’s too wet for a trek, but the teacher is a natural, and Rosa is going round-the-world in the saddle before the hour is up. For more on the Fermanagh Lakelands, visit fermanaghlakelands.com. Lough Erne Resort (+44 (0)28 6632 3230; lougherneresort.com) has two nights for a family of four in a lakeside lodge, with one dinner, from €493 throughout summer. 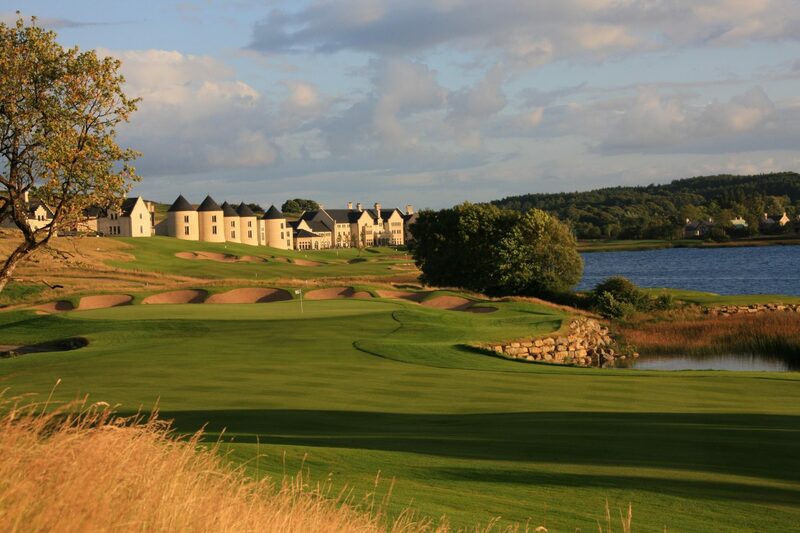 Lough Erne Resort has had its troubles, but this is a quality five-star resort shored up by staff who tap the best of the Northern Irish friendliness without sacrificing any professionalism. This review originally appeared in The Irish Examiner.